GENERAL LOCATION Southern part of Grant; about halfway between North St. Paul and Stillwater. MODERN ADDRESS Located on Hwy. 36. DISTRICT BOUNDARIES Eagle Point Lake marks the southwestern corner, the district stretches about four miles east from there and a couple miles north. 1874: District established, school built. 1898: The blackboards are remodeled. Before, the blackboards were just boards painted black. 1933: Lohman teams win first honors in athletics, and took championships in Newcomb and relay events in track finals. Enrollment in 1898: 32 students. In 1938: 21 students. 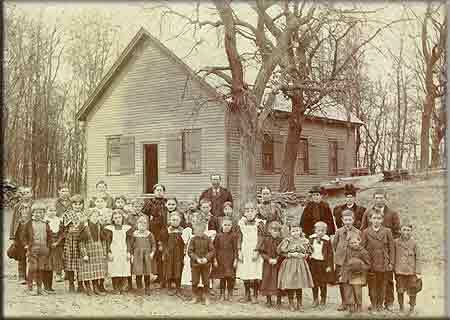 School was for 4 months in the 1870s. Other teachers: (before 1898): Elsie Bloomer, Martha R. Elliott, Mr. Borell, Miss Hannan, Clara Dotts, Mary Day, Matie Collopy, Emma Scott, Mollie Lane, Kate McGary.